The well-known work of art belonging to the brush of Ilya Repin “Seeing off a Recruit” was published in 1879. The painting is made on canvas with oily paints. It has dimensions of 143×225 cm. Now the picture is on display in the Russian Museum, which is located in the city of St. Petersburg. Ideas concerning the writing of the canvas originated from the artist at the time when he and his family were visiting the Abramtsevo estate. It belonged to his friend patron Savva Mamontov. With whom the master met abroad at dinner at Tretyakov. 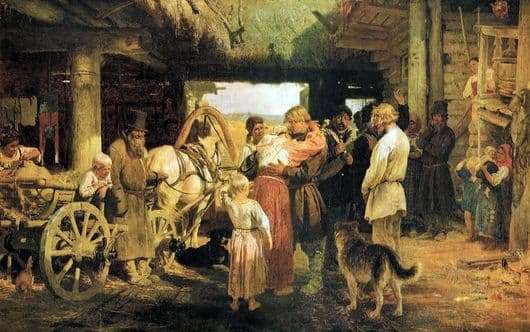 As a guest, Repin walked for a long time in the surroundings of the manor and had the opportunity to observe peasant life. One day the artist happened to be a witness to the scene of the wires of a young recruit. The picture more than realistically displayed the difficult existence of the peasants. Such cases as seeing off are always emotional and sensitive. The canvas depicts people who came to say goodbye to the draftee. Literally everything is permeated with sadness. Even small children look sadly. Depicted animals, as if everyone understands and acutely feel what is happening. Sad views of others convey the essence of the plot. The central place in the picture is given to the weeping mother on the shoulder of her son. She is deeply worried about parting with a young man. All present understand that this may be the last meeting. Nearby in silence, there are already many old people who have already seen, it seems that only they know the future of the guy. If you carefully examine each figure depicted on the canvas separately, you can clearly feel his feelings and experiences. Although all of them and shrouds the tragedy of what is happening, each person here is busy with his own business. From this picture becomes even more interesting and emotional. In addition, Repin wonderfully depicted the life of the peasants. Here is a wooden house, a hall, and costumes in public. All this perfectly conveys the spirit of the time.